Two Driver and Vehicle Standards Agency (DVSA) enforcement officers have been recognised for their quick thinking in incidents on the M6. Neil Whitehouse and Paul Harding received commendation certificates on 6 December 2016 from the Central Motorway Policing Group (CMPG). CMPG is made up of officers and staff from West Midlands, West Mercia and Staffordshire police forces. Neil was on duty on the M6 in June 2016 when he helped to prevent a suicide attempt by a teenage girl at Doxey in Staffordshire. She had run away from a social care facility. A member of her care staff was following her when Neil pulled over his vehicle and ran to help. They pulled the teenager to safety from a bridge’s railings. Neil then had to restrain her as she made a further attempt to take her own life. Paul was on duty in August 2016 when he saw a man running on the M6 motorway, trying to evade police officers. Thinking quickly, Paul slowed vehicles to a stop to prevent the suspect and other motorists from harm. As the suspect passed by, Paul tackled and restrained him. It enabled the police officers to arrest the suspect. I am immensely proud of the swift actions taken by Neil and Paul. Due to their quick-thinking they helped prevent the loss of lives and bring an offender to justice. All our enforcement officers are trained to a very high standard enabling them to remain calm and professional in all situations. 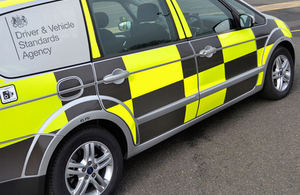 Central Motorway Policing Group are assisted regularly on the motorway by key partners including DVSA. Both Neil’s and Paul’s actions were particularly welcome as they prevented potential serious injury to a young person and the apprehension of an offender. In both incidents they displayed courage and professionalism and it was a real pleasure to be able to recognise their actions at our annual awards ceremony.